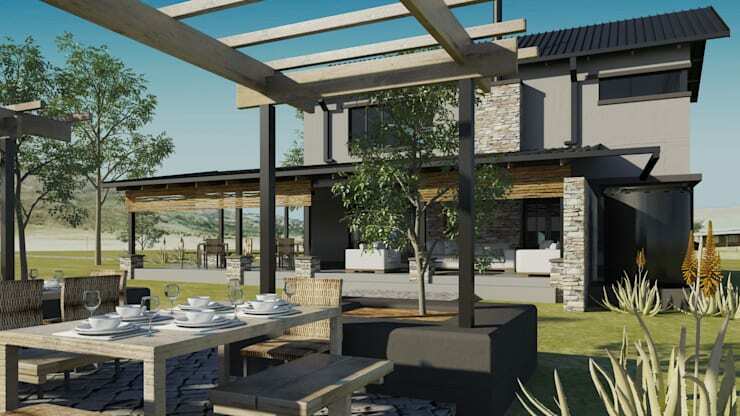 When clients contacted architectural firm Edge Design Studio Architects with the request of designing a holiday/weekend home in their favourite getaway spot (Wakkerstroom, the second oldest town in the Mpumalanga province), the professionals jumped at the chance to show off their design skills. In addition to giving the clients what they wanted, the experts also had to ensure their design was simple and compact enough so that it could be easily maintained, seeing as the owners wanted to rent out their little gem. 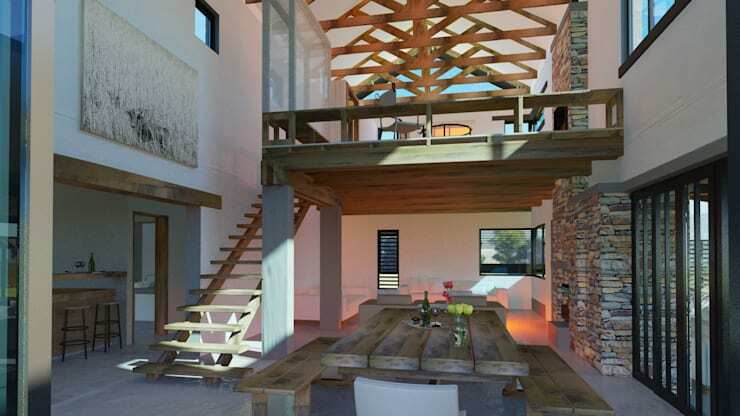 Clocking in at 120 m², this holiday/weekend house enjoys quite the spacious layout. And we just love the country-meets-rustic-style effect with which it’s been designed, making use of striking materials (timber, concrete, stone, etc.) to neatly style it up on the outside. Shall we see what’s going on inside? With double-height ceilings, the spacious look we saw on the outside is carried through most successfully to the interiors. And here the striking materials which adorned the façade also continue – notice the stone-clad wall on the right, the timber trusses adorning the ceiling, the wooden open-riser staircase, etc. At the back of the house, the architects treat us to an exterior dining/socialising spot, where a timber-clad dining set looks ripe and ready to treat us to some fresh outdoor wining and dining – underneath a charming wooden pergola, of course. But a pergola is not the only element you can use to style up your garden space – have a look at the 14 best (and worst) DIY garden ideas. Would you consider this for your weekend/holiday home?